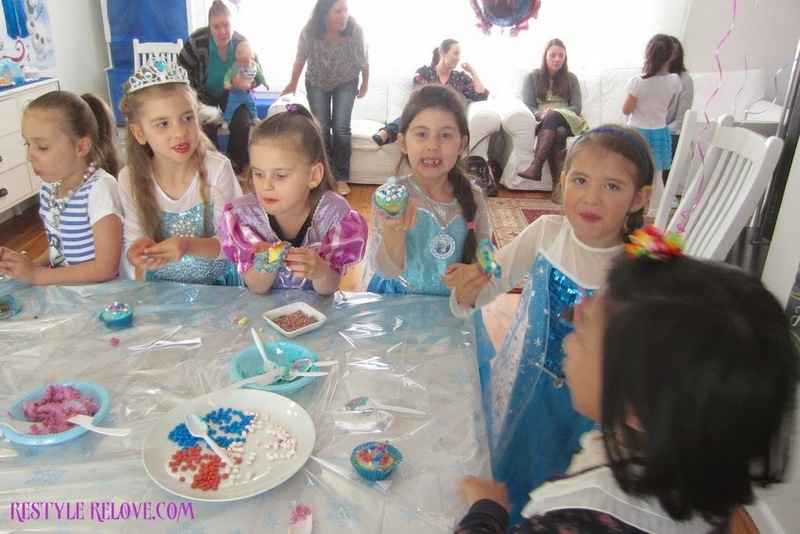 7 Year Old Frozen Birthday Party! It feel like my blog has been "Frozen" in time. Well, I have been anyway. ;) I've been preparing another birthday party. 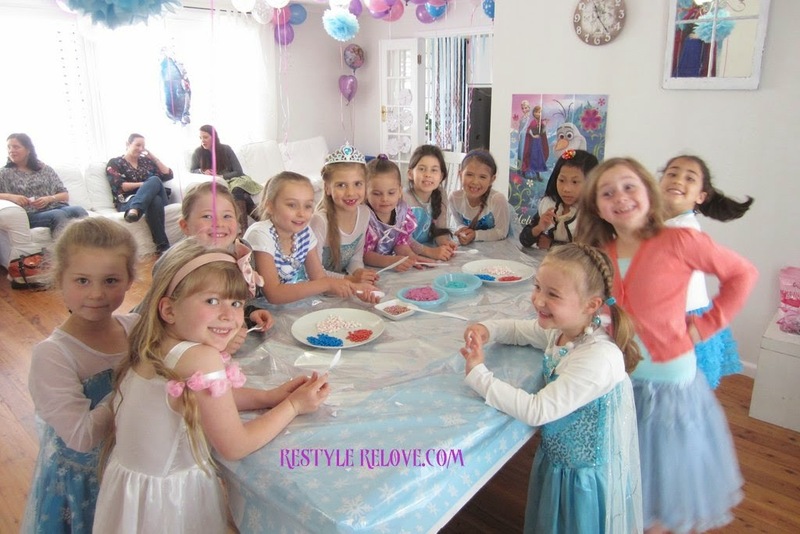 This time a Frozen birthday party for my 7 year old daughter. 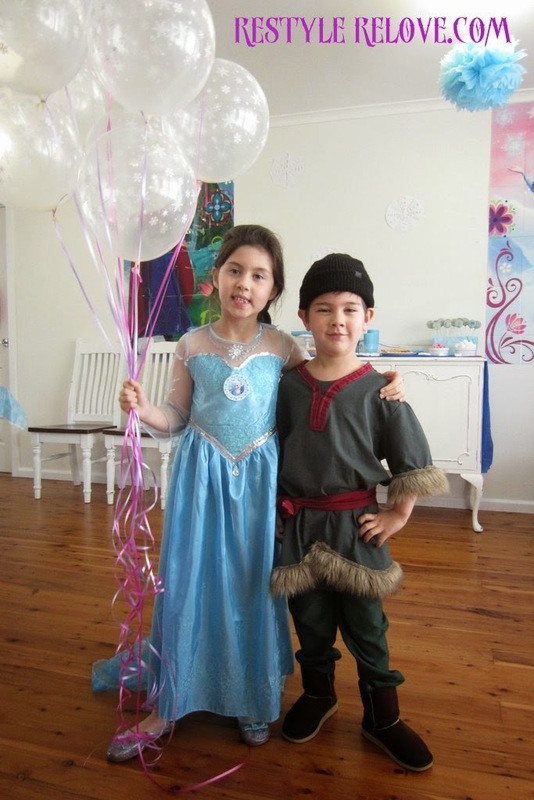 NUMBER OF GUESTS - 12 girls (including my daughter) and one boy (my little Kristoff). VENUE - Inside our house as possible rain was predicted. I found a blank invitation template and filled in the party details. I printed the invitee's name on the top of each invite in pink fancy writing. Then I cut them out and backed them on pink cardboard. 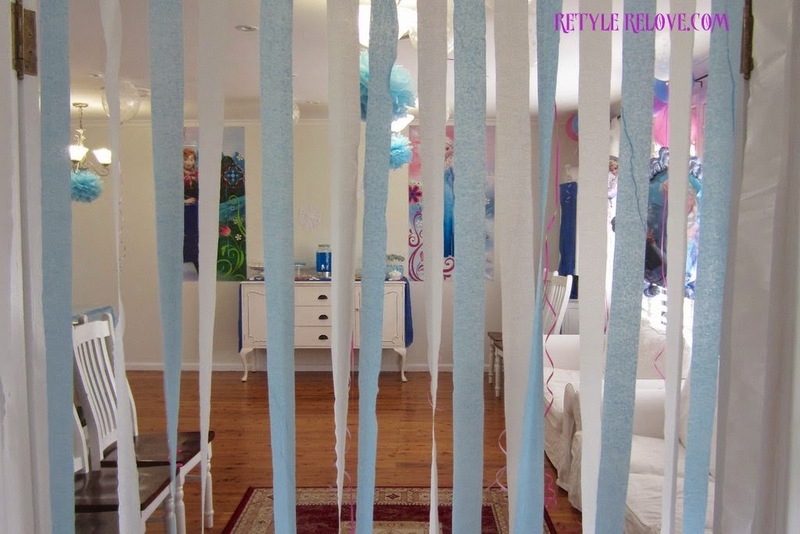 The guests entered our lounge room through a curtain of blue and white streamers. I hired a helium tank and purchased balloons in a pearl blue, pink and purple. I also ordered clear balloons with white snowflakes off ebay. 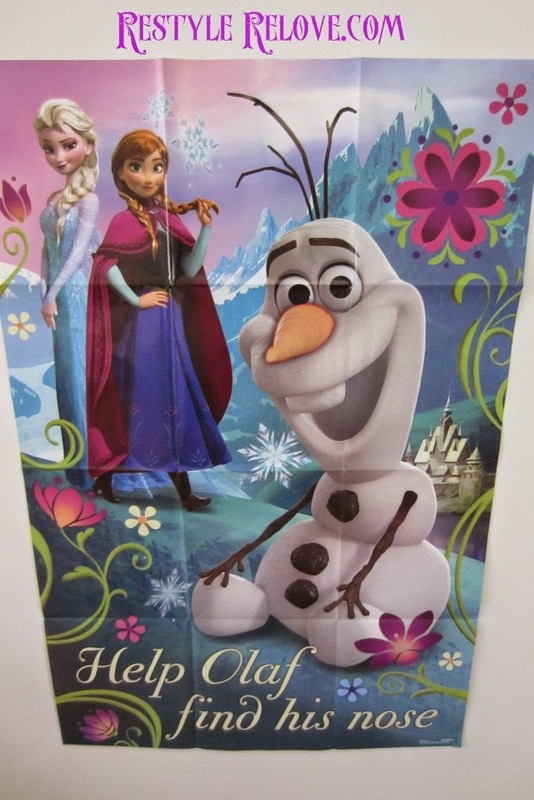 I also bought a bouquet of foil Frozen themed balloons which we inflated on the day. 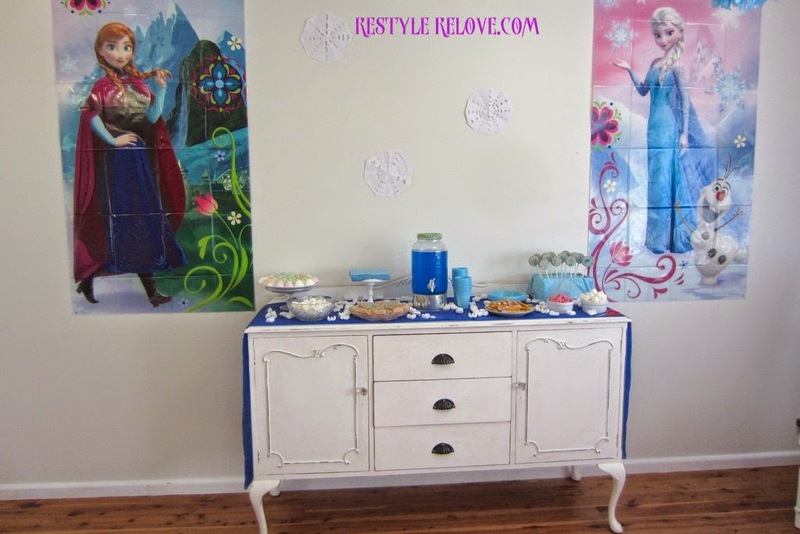 I also purchased a Frozen scene setter for the wall and hung the large pictures of the sisters on either side of our buffet which held all the sweets and drinks. 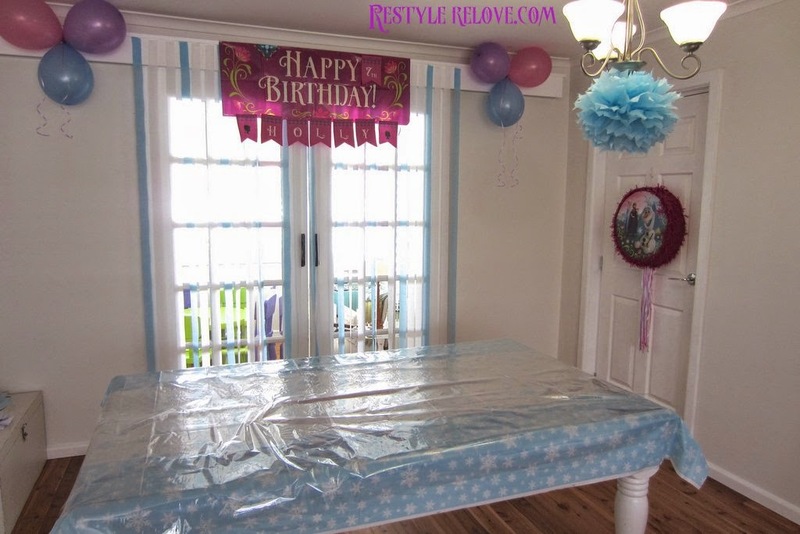 The birthday scene setter banner I hung on top of a curtain of blue and white streamers covering our sliding French doors. 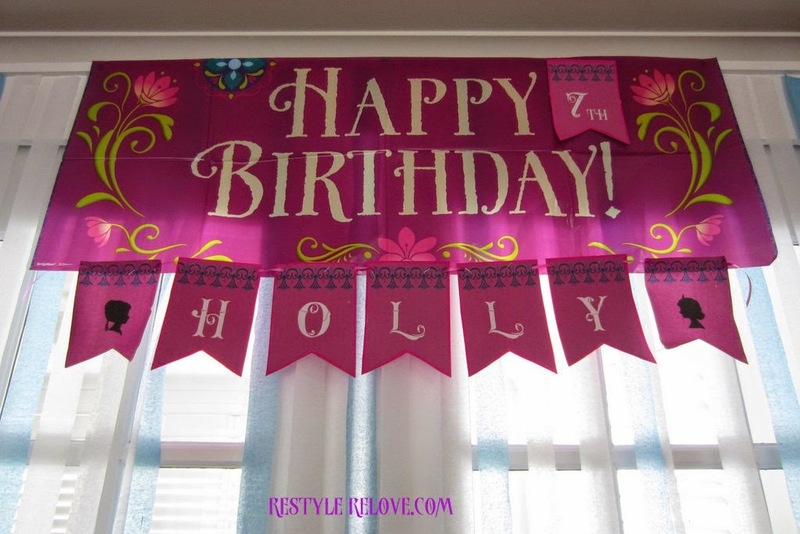 I used a template I found online to create Holly's name banner and age pennant. 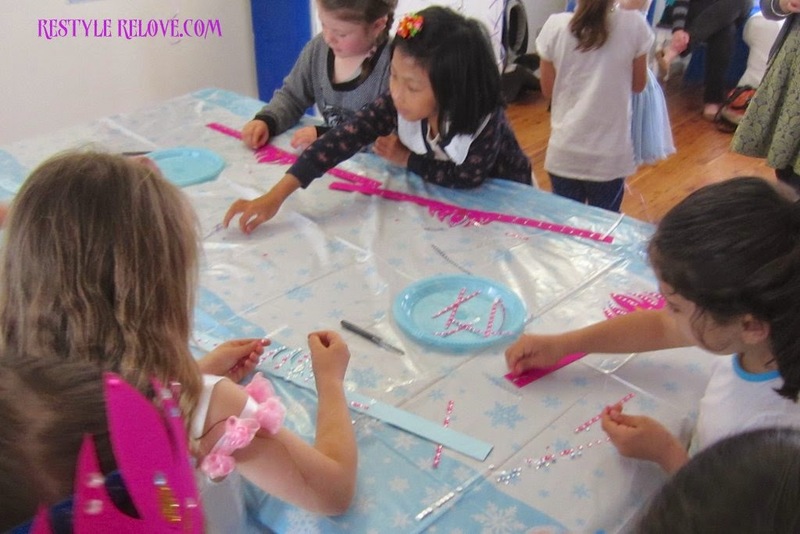 Snowflake making. I prefolded the white paper templates and had each child cut their designs on arrival. Then we stuck them on the front door as decorations. Cupcake Decorating. I baked vanilla cupcakes in blue cases and made pink and blue icing for the guests to apply. 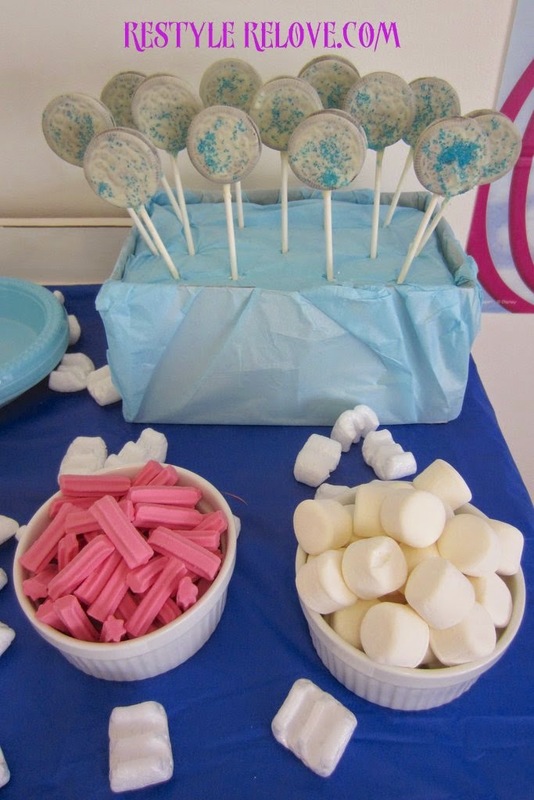 I also had mini marshmallows in pink and white, pink sprinkles, pastel edible pearls and mimi mnm's in blue and pink. Warm hugs game. We made this one up. Someone stands in the middle of a circle of seated children and closes their eyes. A parent silently points to a child who stands up behind the person in the middle and in their best Olaf voice says “Hi, I’m Olaf and I like warm hugs.” The other child has to guess who it is. If they do, the Olaf impersonator gives them a warm hug and becomes the person to stand in the middle and a new Olaf is chosen. This game went exceptionally well. 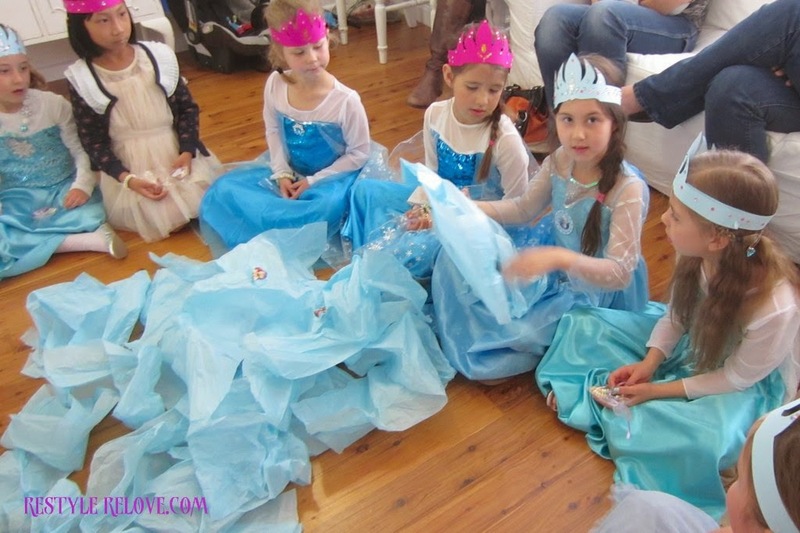 Elsa and Anna Crown Making. I precut blue and pink crowns from cardboard using a template I found online. I purchased sticky jewels at a discount store and the girls got to decorate their crowns and stick them together to the size of their heads. This was also a hit. Pass the parcel. I used blue tissue paper for the layers. I enclosed a candy bracelet in each layer, which was wrapped in a ribbon tied plastic bag with a Frozen sticker on the front. The main prize for the birthday girl was an Anna jewellery set. Chopstick marshmallow game. I had the girls split into 3 groups of 4. Then each group had 20 seconds to put as many mini marshmallows into a noodle box using chopsticks. The girls struggled picking the marshmallows up and ended up using their hands. Musical Statues with Frozen music. While I was cutting up and handing out the cake at the end of the party, the girls amused themselves playing musical statues to Frozen music. Snowcapped marshmallows. These I made by dipping the tops in melted white chocolate and then blue sprinkles. White meringue snowballs. I used store bought meringues. 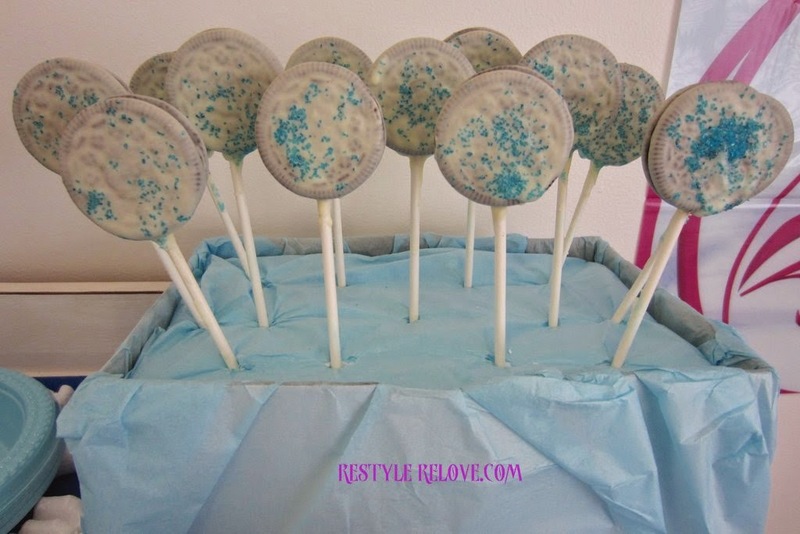 Oreo Pops. I separated oreo biscuits and then attached a stick to the centre with melted white chocolate and put them back together. Then I dipped them all in white chocolate, then sprinkled on blue sugary sprinkles. 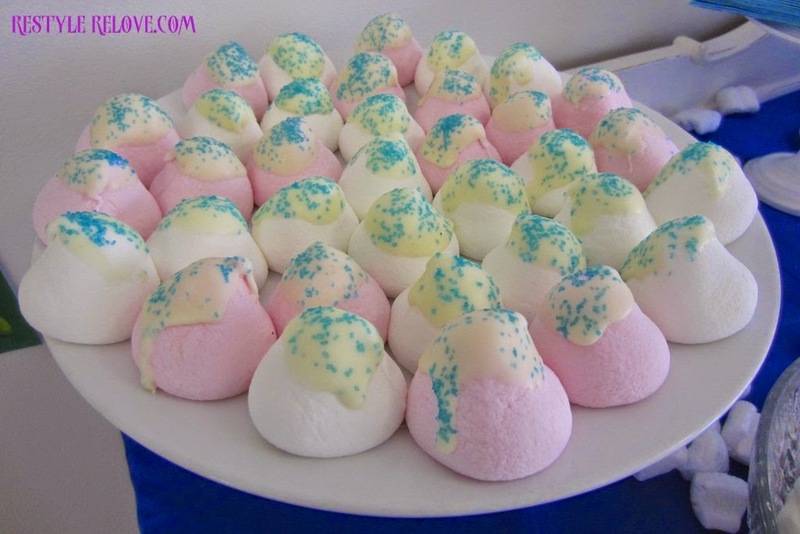 Pink Musks and white marshmallows. These were store bought. 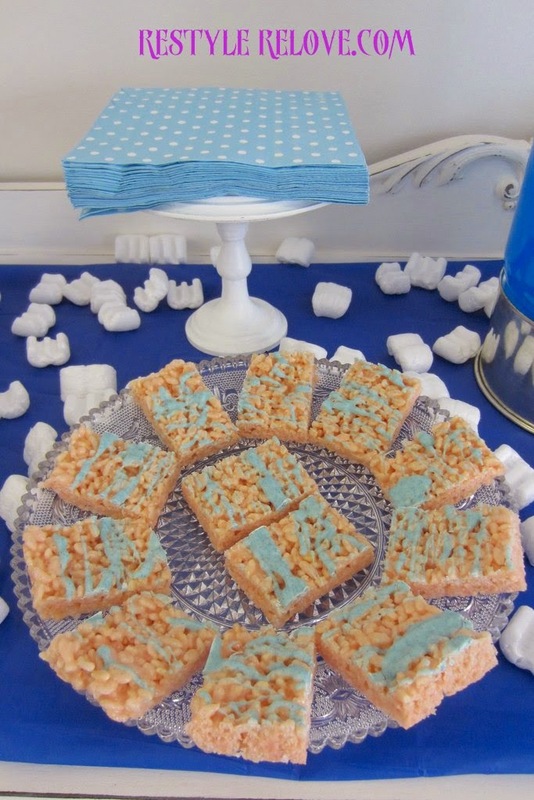 Rice Bubble Squares. 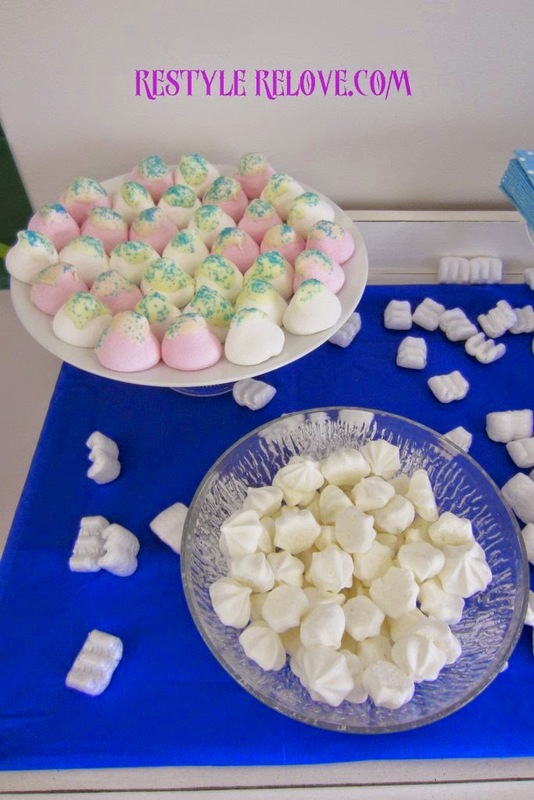 I made these from rice bubbles, melted marshmallows and butter, drizzled with melted white chocolate that I food coloured blue. White chocolate bread stick wands. These were delicious. 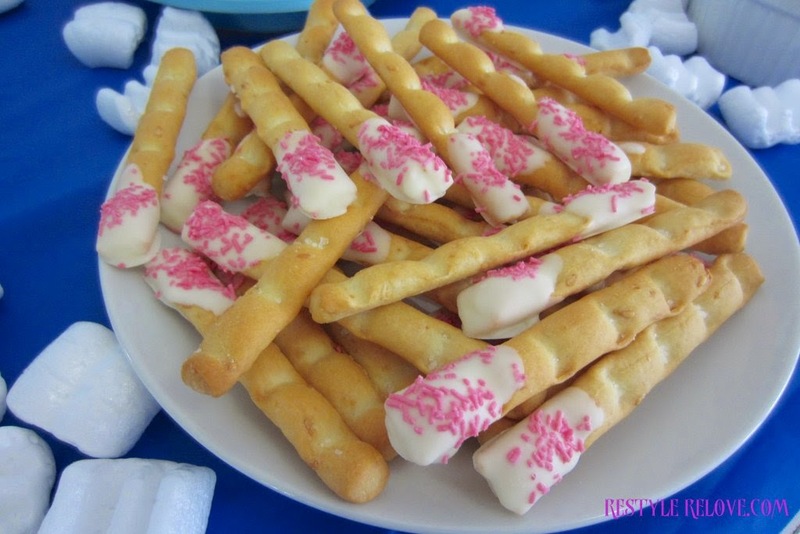 I used small packet breadsticks, then dipped the ends in white chocolate and sprinkled them with pink sprinkles. The salt and chocolate were a really good mix. Blue Frozen Jelly with snow capped whipped cream on top. 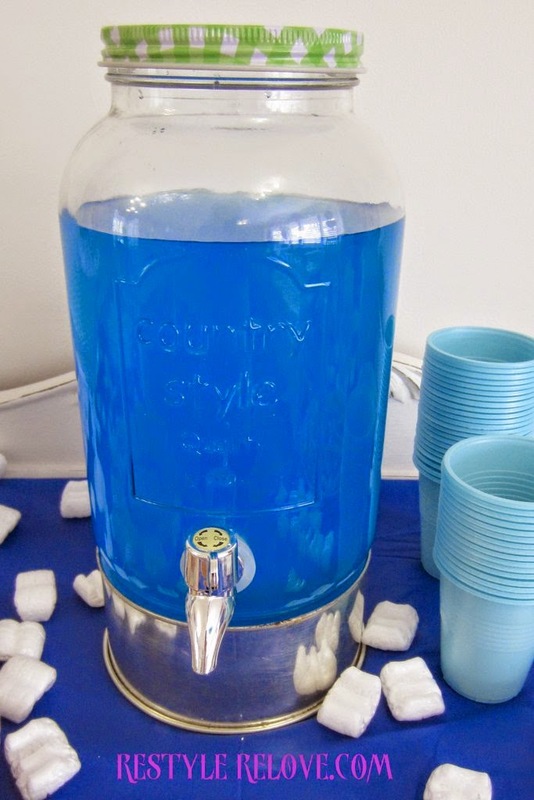 Blue Gatorade in a glass drink dispenser. I made the cake using vanilla cake mix. I used buttercream icing in the middle of each layer. Then covered the outsides with buttercream icing which I food coloured in blue and pink. The Anna and Elsa paper toppers I found online and printed out. They site on the cake using a straw. 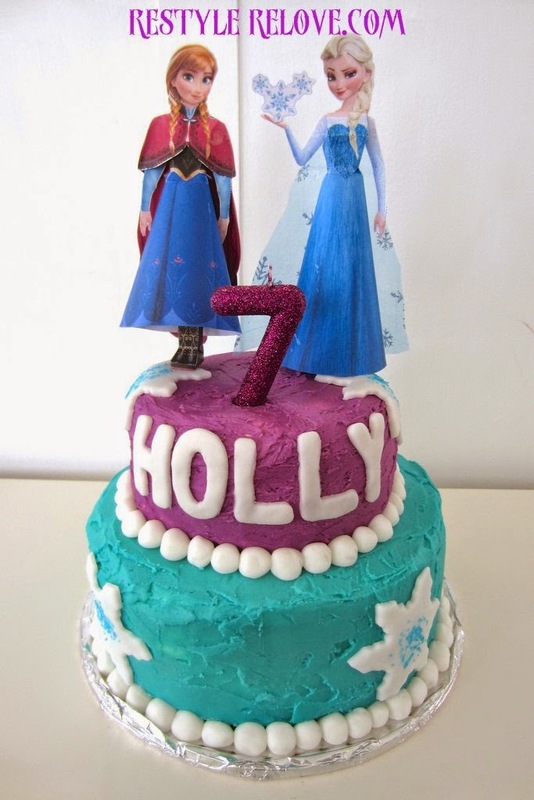 I purchased a snow flake cookie cutter to do the fondant snowflakes and I had letters to make Holly's name. I purchased the perfect pink glitter number 7 candle. The snowballs were made from white icing and edged the cake layers perfectly. 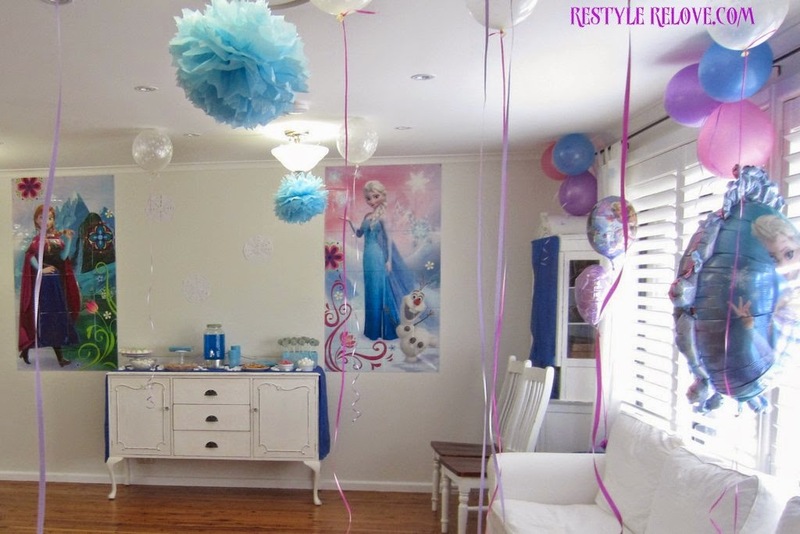 And another year of kids party planning is over! Ohhhhhhh Julie this is too cute. What a creative and fun party. I bet your daughter and all the girls loved every minute. So sweet. What a fantastic job and the little girls look so happy.I wish I had a little girl in my life to do that. Thank you! Yes, I feel very blessed.